Obviously this movie had to be reviewed because it’s just so amazing and does not get enough credit! When a group of scientists are offered funding into genetic research if they agree to try and clone the greatest ever Pokémon, Mew, the end result is success and Mewtwo is born. However Mewtwo is bitter about his purpose in life and kills his masters. In order to become the greatest he throws open a challenge to the world to battle him and his Pokémon. Ash and his friends are one of the few groups of trainers who pass the first test and prepare for battle. However they soon find out about further cloning and Mewtwo’s ultimate plan for the earth. 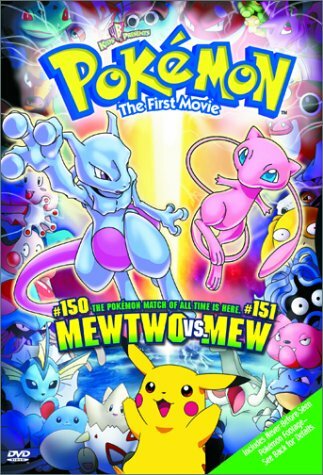 Even for non Pokémon fans this movie is amazing and if they disagree then keep that opinion to yourselves. From the start you are hooked into the main events of Mewtwos story and immediately feel amazed by his power, understand the way he thinks and feel sorry for him because of how his ‘masters’ treat him. Who could blame him for wanting to be more than to be used as someone’s pawn. I must say that despite Pikachu being the worst Pokémon in my opinion, he is pretty badass in the movies as in the first battle he takes out 3 Pokémon with one move (which obviously doesn’t ever happen but oh well little details). When Ash is first introduced to Mewtwo and all the main events kick off the other trainers just seem to fade out and aren’t noticed as much but not too much problem because there’s the epic battle between Pokémon and their clones. It’s a shame to see them put against each other to a fight to the death since they are so equally matched and also because Pokémon are not like that. You still have to love the Psyducks because they look so confused after each hit it’s even more adorable than they already are (you can guess who my favourite Pokémon is). You have to be truly heartless to not cry at the end when Ash is hit and turned to stone. But it’s great that it’s Pikachu’s tears that finish it off and bring him back, their connection is just brilliant and you can see they both care about each other and they are actually friends. I could continue going on about how awesome it really is but if you have seen it you already know its amazing and if you haven’t then watch it now!